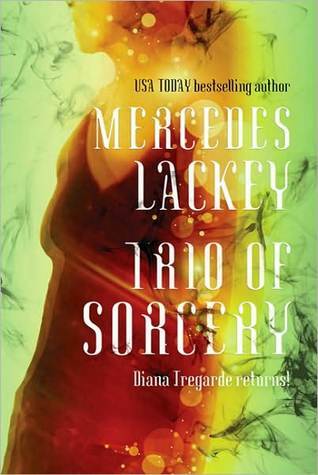 Mercedes Lackey brings three strong heroines in a trio of novellas spanning the decades. Arcanum 101 has Diana Tregarde, witch and Guardian, heading into her freshman year at Harvard with a kidnapping, a psychic and a courseload looming. In Drums, Osage shaman and private investigator Jennifer Talldeer faces off against an old and angry ghost looking for his lost love. The final story, Ghost in the Machine, brings in "techno-mage" Ellen McBride and finds that the power of online gaming isn't always just computer chips and code; it can be magic as well. When I was in college and working at the local Waldenbooks, I came across the first Diana Tregarde book, Burning Water. After devouring the next two (Children of the Night and Jinx High) I was sad to learn there would be no more stories about her. When I saw this book sitting on the shelf at the local bookstore, 20 years later, I was thrilled to have her back. This story goes even further back: back to the early 1970s, when Diana was a teen, heading off to college and newer into her Guardian powers. Called on by contacts in the local police department to sniff out a fraudulent psychic. Diana soon discovers this psychic is no fraud, and must use her power to bring a kidnapper to justice. Lackey brings a little more of Diana's back story in, her parents' death, her grandmother and her first Guardian battle. Lackey also brings the time period into focus with vivid scene descriptions. Diana was always older than her years, being a witch and a Guardian (one who is tasked with helping and protecting others) brings a maturity that is balanced by the other college students living upstairs from her, especially as they become involved in her investigation. During that time (early 1990s) I also picked up a copy of Sacred Ground. Jennifer Talldeer was another strong heroine, battling evil spirits and bad businessman as an apprentice shaman and private investigator. Lackey brings her back right where she stopped: reforming her relationship with her boyfriend David, sparring with her grandfather, and bringing her strength as an investigator and a shaman together to help a young man discover why his girlfriend was dropping out of sight. While he was fearing a difference in their Native American backgrounds, no one was expecting a ghost to be in the middle of this investigation. Jennifer Talldeer's relationship with her powers as a shaman and spiritual warrior were balanced by her intelligence and prowess as an investigator. Ellen McBride is a brand new heroine. While I do not partake in MMORPGs (Massively Multiplayer Online Role-Playing Games), I have played *cough* several online games and know that the amounts of personal energy that go into them can be tremendous. Between the players and the programmers' belief in their creation, they bring a Wendigo to life in their game, one that threatens to break out of the machine and enter the real world. Ellen comes in with her coding abilities - and her magical ones - to help take the creature down. The interactions between Ellen and the other programmers is quick and smart, and this story is hopefully (please, pretty please?) the start of a new series from Lackey. Mercedes Lackey is a skilled author, pulling from many different traditions and beliefs to create the various worlds in her books. Time and technology actually followed through all three stories: from the lack of it in Diana's college days in the 70's, to Jenni and David lamenting about needing cell phones that were not the size of bricks, to Ellen's elaborate workstation set-up that would make a programmer weep. Her magical familiar/robot dog was a treat too, especially for those who loved K-9 from Doctor Who. While the stories here are self-contained, I would definitely recommend reading the previous Diana Tregarde and Jennifer Talldeer books. Trio of Sorcery is a wonderful collection for anyone who enjoys urban fantasy with smart female leads. You are almost making me want to re-read!